Exodus 17:-2-7 Therefore the people contended with Moses, and said, "Give us water, that we may drink." And Moses said to them, "Why do you contend with me? Why do you tempt the Lord?" And the people thirsted there for water, and the people complained against Moses, and said, "Why is it you have brought us up out of Egypt, to kill us and our children and our livestock with thirst?" So Moses cried out to the Lord, saying, "What shall I do with this people? They are almost ready to stone me!" And the Lord said to Moses, "Go on before the people, and take with you some of the elders of Israel. Also take in your hand your rod with which you struck the river, and go. Behold, I will stand before you there on the rock in Horeb; and you shall strike the rock, and water will come out of it, that the people may drink." And Moses did so in the sight of the elders of Israel. So he called the name of the place Massah and Meribah, because of the contention of the children of Israel, and because they tempted the Lord, saying, "Is the Lord among us or not?" 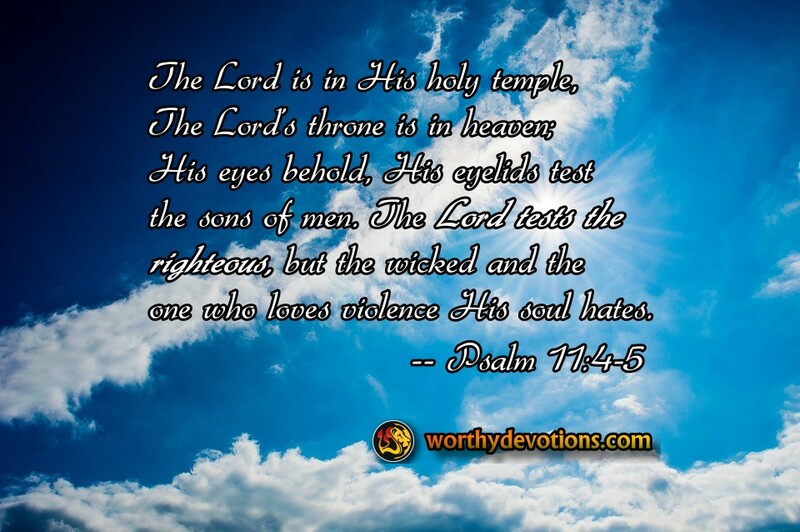 Psalm 11:4-5 The Lord is in His holy temple, The Lord's throne is in heaven; His eyes behold, His eyelids test the sons of men. The Lord tests the righteous, but the wicked and the one who loves violence His soul hates. The children of Israel are facing yet another test, this one, even more severe than hunger -- dehydration -- which, unabated, quickly leads to a miserable death. Yet, now, every day they are also seeing the miracles of God, who is feeding them regularly with manna, and surrounding them by a pillar of cloud by day and a pillar of fire by night. Once again, they fail the test, even in the midst of their daily witness of miracles. So even though the test is more severe, the evidence for trust is that much greater. Are some of us also asking this question, "Is the Lord among us or not?" "Is He seeing what's happening to me, or are His eyes shut to it?" ("His eyelids test the sons of men..") As a pastor, I'm often faced with this question -- "Where is God?" Most often the good and true answer is, "He is testing you!" And I think of the testing the children of Israel faced in their wilderness wanderings. Over and over again, the Lord provided for their needs. This time Moses strikes the rock -- and out pours living water! Don't allow your heart to become hardened in these days no matter how severe the test. As you endure His testing He will touch your heart once again so that His spring of living water may flow through you to this dying and desperate world. Yeshua (Jesus), the Rock of our salvation was struck for the sins of the world, and He promised those who trust Him that living water would flow from our inmost being. And God's eyes are never really shut. So the question, "Is the Lord among us or not?" will repeat Israel's sad mistake at Meribah. Just realize and accept that you're being tested. You will please Him with your faith and His living water will flow from you. For HE will hold me up with HIS right hand!